The temperature has dropped further and the days have become greyer here as we head into winter properly, so it’s soup time again. I’ve always loved split pea soup cooked in any way, smooth or chunky. 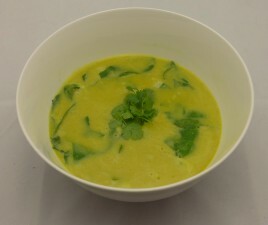 But today I decided on a smooth soup of yellow split peas, mild indian style curry spices and coconut milk. To serve, I spooned some leftover cooked brown rice into the bottom of the bowl, added some spinach and poured the hot soup over the top so it wilted. It made a really satisfying meal. The smooth background of the soup with the chewy pieces of rice made a nice contrast. Put the soaked split peas in a large pot with 4 cups of water with a large pinch of salt. Bring the peas to a boil, reduce to a simmer and skim the surface of any foam. Heat the oil and fry the onions until they soften and colour. Add the spices and fresh coriander and fry briefly to toast them. Add the onions and spices to the peas and cook until the peas are completely soft. Taste and add salt and lime juice. To serve put ¼ cup of rice and a handful of spinach into each bowl and ladle the hot soup over the top. Garnish with some extra coriander leaves. This soup would work fine if you replaced the spices with 2 teaspoons of curry powder. Yum! I’m on my way home and just decided I’d make pressure cooker risotto for dinner (it’s one of our favourites too), but now I’ve seen this soup…I’m torn between them!